Bear Titan Bow is an excellent bow especially made for teenagers and or pre-teens, age starts from 12 years. The composite limbs and riser made of fiberglass and it comes up with the complete setting – with string and two arrows which is excellent for a start shooting by youth, beginners or by an intermediate archer. It surely will create excitement amongst the young archers and might last for many years as they learn it well. Who not heard the name of Robin Hood or William tells in teen ages? Bear Titan bow makes those tell live among the juniors when they touch the bow and shot by it. It truly brings up fun and excitement in their life.It is also mentionable that, the Bear is such a company which leading this youth and archery industry over last 80 years. Their motto is to create the best archer by providing a good quality recurve bow in the hand of younger and beginner and make them legend in future. Let’s join with me in my Bear Titan Bow Review to know more on this fantastic device.If you already impressed and decided to buy then click the button & check the latest Price . The Bear Titan Recurve Bow features a nicely designed, integral composite full-sized solid 1-piece glass flex, comfortable molded poly handle grip, and lightweight weighs less than 1.6 pounds which makes it an extremely light bow but the frame solidly built. It is ambidextrous in nature, so you can use both left and right hand to play with Bear Titan. Conversely, you no need to worry, it is not only a toy, and it is a full working bow. To bring joy and happiness among children Bear design this bow with a draw weight of 20 to 29 pounds and length 22-28 inches. This weight is perfect for learning target shooting, and the user can adjust the draw length as per his ability. This bow comes with two safety glass 28’’ arrows. These arrows are good enough for starting, but the plastic fins are not up to the mark. Plastic fins have an affinity to fall quickly. So, it is better to change this arrow with a feather paddles one. I recommended using carbon express arrow with 28-30 inches length. Carbon arrows are more durable rather than the aluminum or plastic one. If you use an upgraded arrow, this bow will allow you to gives more accuracy even for small hunting game. As the Titan designed for teenagers, so it constructs bow with a draw weight of 20# to 29# which is not a powerful bow compare to another high end. However, you can shoot arrows by it from a distance of 25/30 yards with accuracy, and it penetrated the foam core target easily. If you adequately tuned the Bear Titan, you will get accurate shot even from a distance of 50 yards with 3’’ groupings. If you want shorter groupings that is 2’’ then you will get the same accuracy from a range of 40 yards. The children’s are of the age of 12 or up can use this bow. Overall bow length 60 inches is more forgiving for little champs. It will serve your child without a glitch until they are ready for an adult bow. 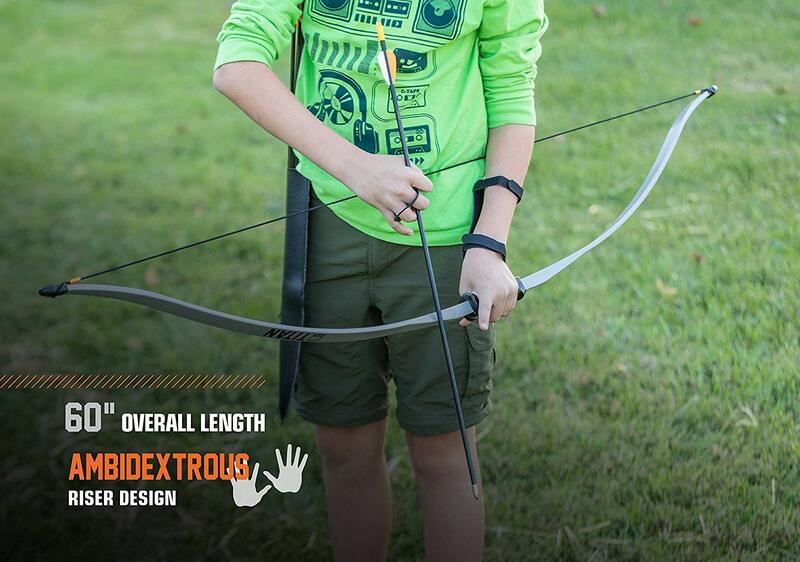 It’s lightweight and ready to shoot package, in-box with string, tow safety glass arrows, arm guard, and finger tab. Carrying too is easy. Well-known Brand. All these features are positive for use this bow by your child, they enjoy it, guaranteed. The Bear manufactured the Titan Youth with simple in design, extra fearless, utilitarian design. Stringing the bow is the only assembly prerequisite, and you can do this within a few seconds. Once strung, pull up and using the bow is comfortable and au fait thanks to its ergonomic, ambidextrous hand grip. Q. What is the weight of the Bear Titan Recurve Bow? Ans. 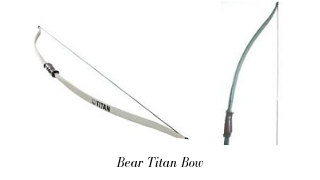 : The Bear Archery Titan Bow is a very lightweight bow, and it’s only one and half a pound which makes it suitable for holding by the children a long time and helps to shoot accurately at the target. Q. Is the bow accept accessories? Ans. : In design, there found no hole for set any accessories. One can drill it for fixing sight or stabilizer, but that will not wise as it may hamper the life of the bow. Q. Is it suitable for hunting? Ans. : Bear Titan is a lower draw weight bow 20# to 29# which is not suitable for big or medium hunting game. The recommended draw weight for hunting is minimum 40# in many states. However, it is accurate and potent enough for hunting small animals. Q. Is this a teenagers bow only, or an adult can play with it? Ans. : It is true that Bear specially design it for pre-teens or teenagers, but an adult beginner can also shot with it. Nonetheless, it is a perfect bow for archer practice thus you can use it in any archery training institute. Sentinel Youth is another excellent archery recurve bow designed for teenagers and beginners. It made with highest quality components and a trusted name in air-soft or air gun equipment and accessories industry and come up with necessary accessories like quiver, arrow rest and pin sight. It is a takedown bow; you can quickly detach the limbs during carrying. Sentinel built with heavy duty composite limbs with customized all weather string system. However, this is little short bow tip to tip length 45-inches only, design only one draw weight 20 Lbs. and max. draw length 25’’ which is a bit lower than the Bear Titan Youth. Sentinel also suitable for right-handed archers only. Observe overall features; I think Titan is a bit advanced recurve bow than Sentinel. Bear Titan Bow is hard-hitting and sturdy enough to withstand against rough use by youth who are not gentle on their equipment. The brace height is very forgiving against lousy stance and technique which makes it best learning archery bow. Countless thousands are using this bow to make them perfect and competent for future competitions. So, if you want to see your son or daughter as a world champion of traditional archery competition, then you can trust Bear without any doubt. Thanks for reading our Bear Archery Titan Bow Review.